Join us for the 50th Anniversary Celebration at Lost Pines Scout Reservation on October 28! Register by October 25 for your "no charge" participation fee. Learn more and register by visiting http://www.bsacac.org/lpsr50th.php. Winter Camp is filling up quickly! Session one is almost full and session two is catching up quickly. Come on out for a fabulous camp experience. 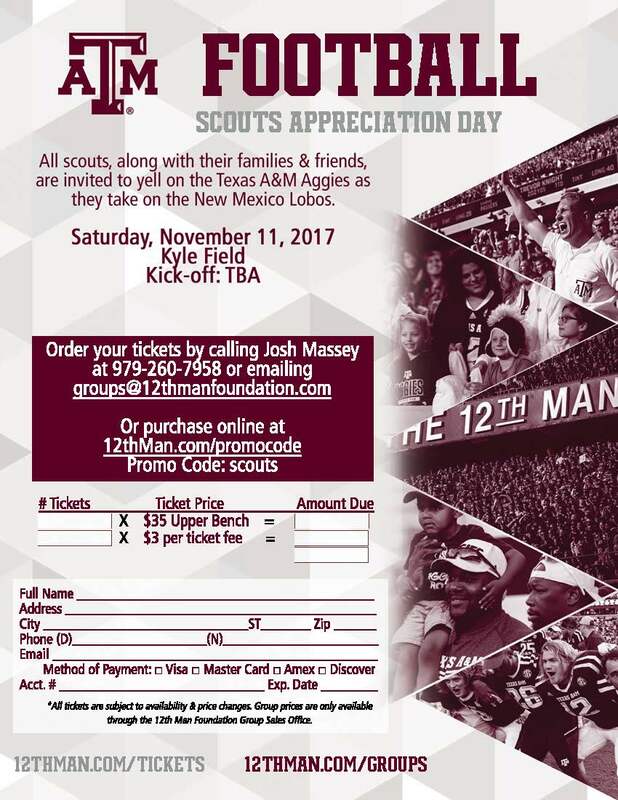 Contact Keri Smeaton at 512-617-8610 to reserve your spot today! CLICK HERE for more information. Our council's annual Sea Scouts Bridge of Honor ceremony will take place on Wednesday, October 25, at 7:00pm at the Fickett Center. Anyone interested in Sea Scouting or congratulating Sea Scouts on their advancement accomplishments is welcome to come out and watch. Only a few spots remain for the upcoming National Youth Leadership Training, our most popular youth leadership course! Don't wait; register today! December 27-January 1 at Camp Green Dickson. CLICK HERE to learn more and find registration links. Seabadge will take place November 3-5 at Camp Wisdom near Dallas. It is an adult leader training experience aimed at both current and prospective Sea Scout leaders. The goal is to help them learn how to run a successful Sea Scout ship. Part of the course is about how to help older youth accomplish planning, goal setting, communication and risk management. Part is about topics unique to Sea Scout ships such as how to decide whether or not a boat donation will work for your ship, youth protection on boats, how to plan a long cruise, and more. The most important part is the fellowship - spending a long weekend with lots of creative people with great ideas about Sea Scouts. You don't have to be a Sea Scout leader to attend. CLICK HERE for more information and registration. The Boy Scouts of America's national executive board voted unanimously to open Cub Scout membership to girls starting in fall 2018, and institute a program serving middle school and high school-aged girls with the Boy Scout program in 2019. Visit this page for more background information and FAQs. Lynn Brooks has been selected to lead our council's International Scouting Committee. CLICK HERE to learn more about the committee's plans. More than 250 Boy Scouts, Scouters, and parents from our council joined forces in Hurricane Harvey relief efforts in Houston several weekends in September and October. CLICK HERE for the story. Service is one of the methods of the Scouting program. The number of hours recorded performing service is an easily-quantifiable metric that helps us measure our impact on the community and tell the story of Scouting's values. Is your unit reporting its service hours? Do you know how? CLICK HERE for more information. It's Easy To Find Service Opportunities! November is "Good Turn" month in Scouting, and Scouts of all ages are encouraged to focus on service during the month of November. Did you know that your pack can find hundreds of opportunities to serve through our partner, JustServe? Visit their site, enter your zip code, and then click on "+more search options" and check off "Suitable for all ages". Take pictures of your Scouts in action and share their "Good Turn" activities on our council Facebook page! CLICK HERE to sign up (scroll down to "Reforestation on the Blanco River"). If you have questions, please contact volunteer@treefolks.org. Troop 497 invites all units to take part in its Blanco River Canoe Race on April 28, 2018. The winning team receives a new canoe! Camping is offered on Friday April 27 and Saturday April 28. Teams must provide 3 people per canoe. CLICK HERE to contact Troop 497 for more information. How close is your Scout to reaching his goal? Show-n-Sell and Take Order sales end on October 22, but the online sale can be used for prize eligibility until October 31. Need a bit more popcorn to reach that goal? Contact your district Popcorn Kernel to see if there is product available in your area to transfer. Click to view council prizes, Keller prizes, district Kernel contacts. Good luck! Take Orders are due to your unit Kernel by October 22 so that they can place your order by the October 27 deadline. Product will be available for unit pickup on November 10 and unit leaders can visit our council's popcorn page starting October 26 to reserve their time slot. 20 Scouts have won $50 gift cards over the past four weeks. Ten more Scouts will still win! To be eligible, Scouts just need to sell $100 in any phase of the sale during week five or week six. The drawing entry forms open on Mondays and close on Thursdays; winners announced on Fridays. Go to www.bsacac.org/popcorn to view past winners and enter your Scout for the next drawing. Hey Scouts! Are you interested in learning about Animation, Backpacking or Chemistry? What about Digital Technology, Exploration or Fire Safety? Want to know more about Golf, Hiking or Insect Study? Your Scout Shop stocks merit badge pamphlets covering a variety of subjects A-Z. Come by and choose a few topics - keep learning! Remember we offer sewing services for all your uniform needs.